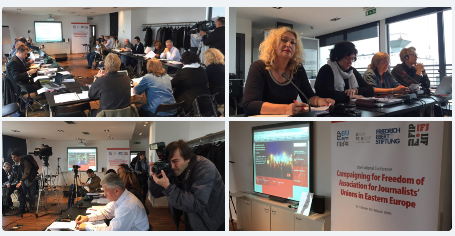 Journalists from across the Balkans and Eastern Europe met in Belgrade (Serbia) on 10-11 October 2015 to discuss the status of journalism in the region and the campaign for freedom of association to enable journalists to freely organise in unions. They discussed the struggles facing journalists, the precariousness of their employment, the low salaries and poor contracts the hostility of employers to journalists unions and the pervading climate of insecurity and fear. This is a struggle not just for improved conditions for journalists, but for a healthy and vibrant journalists sector that can play its democratic role in serving the public with independent, ethical and timely information. 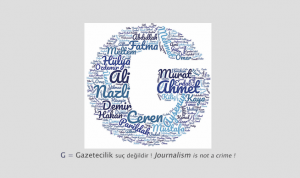 – The Journalists’ Union of Turkey (TGS) for their struggle for journalists’ rights and sent solidarity to journalists in Turkey in the current turbulent period. – Emphasised that it is impossible to have quality, independent journalism without decent working conditions. Professional and labour rights are indivisible. – Condemned the arrogant behaviour of Ringier Axel Springer and the issuing of mass redundancies and downgrading of staff in 2015 in its Serbian companies. – Welcomed the study on precarious workers in media developed by the ITUC in Serbia that highlights the crushing economic conditions in which today’s journalists are expected to work. – Unite – union and associations together – in the joint struggle for professional and labour rights. – Use the crises of mass redundancies to raise the profile of the unions and their importance in addressing the unscrupulous conditions of employment. – Win small victories – whether in the law courts or in organising in the work places with favourable employers – to build the national movement. – Reform labour legislation to ensure they respect international standards and are favourable to the decent work agenda. These laws must backed up by effective implementation through well-resourced labour inspectorates and independent judiciaries. Reform the legal system so that labour cases can be treated quickly and effectively and at minimum cost. 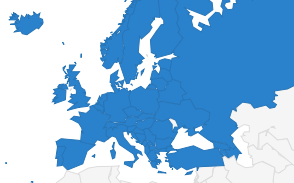 – the European Union, Council of Europe and OSCE (Organisation for Security and Cooperation in Europe) to ensure that freedom of association and decent labour conditions are a central criteria in their assessment of the state of press freedom and their media development strategies. – Recommend that the continuation of the freedom of association campaign and organising events on the extent of the problem in further countries of the region. – Serbian journalists work in appalling conditions without decent contracts, rights at work and on minimum salaries, without work place protection. – That the privatisation process needs to take place in fully transparent manner that ensures the interests of journalists are properly respected, that guarantees pluralism and diversity of ownership and independence. – Creating environment for social dialogue. Where there is no employer association then the government should take role of negotiator on the basis of current practice in Serbia and Croatia in other sectors. – Further called on the OSCE to support this process and the campaign for improved freedom of association and work place rights for journalists. 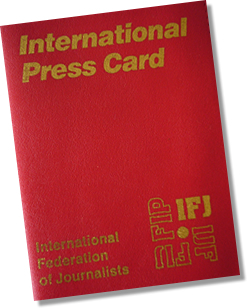 – That labour conditions of journalists should be an issue for government media policy and that existence of unions and collective agreements should be one of the criteria for awarding of any public funds. – All three organisations should be consulted on media policy with respect to their different mandates and ability to represent the views of the members they represent. Finally, participants thanked the Friedrich Ebert Stiftung and Union to Union for their support to the meeting and the ongoing campaign to strengthen journalists unions and labour conditions.